Ascending Butterfly: Winner Announcement - Ascending Butterfly's Hairfreé™ Brushes Giveaway Winners! Winner Announcement - Ascending Butterfly's Hairfreé™ Brushes Giveaway Winners! Yes, you read that right, we have TWO winners this time around! Congratulations to 'Happi Shopr' and 'Carolyn G' (we post our winner's comment/follower names instead of full names, this is why it's in quotes) the winners of Ascending Butterfly's Hairfreé™ Brushes Giveaway! Our two lucky winners will each receive BOTH the flat and round brushes! I am very excited for our winners because I know they are really going to love these brushes! A salon quality blow out at home, what's not to love? We would like to thank our sponsor Hairfreé™. We would love to work with you again! Hairfreé™ is one of our Editor's Picks for our Holiday Buying Guide. I can assure you that you can't go wrong getting a Hairfreé™ brush as a stocking stuffer for anyone on your list! Ƹ̵̡Ӝ̵̨̄Ʒ - Enter to win the Mario Badescu Skin Care Acne Control Giveaway! (ARV $77) by pressing HERE! Our Book Club is running a little late this month, but will launch soon, thanks to all followers who have emailed us requesting their book of the month title! There will be a special surprise twist this month, so keep an eye out for it's return! 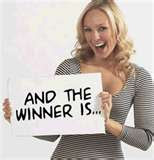 Hairfreé™ provided brushes for review and to giveaway, it was not a paid insertion nor was it a compensated post! All opinions about each reviewed item on this website are expressly my own!